I was busy most of the forenoon with the work. After dinner Will took us down in the Surry I could not have [old pet?] We did not stay long. I wanted to bring Ida home with me but they none of them thought it advisable. 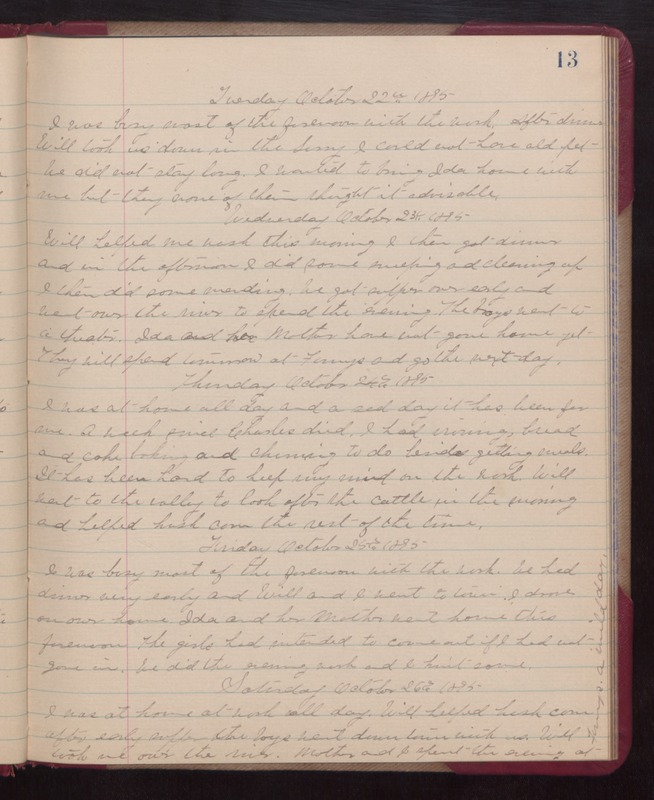 Wednesday October 23d 1895 Will helped me wash this morning I then got dinner and in the afternoon I did some milking and cleaning up I then did some mending. We got supper over early and went over the river to spend the evening. The boys went to a theater. Ida and her Mother have not gone home yet They will spend tomorrow at Fannys and go the next day. Thursday October 24th 1895 I was at home all day and a sad day it has been for me. A week since Charles died. I had ironing, bread and cake baking and [churning?] to do besides getting meals.It has been hard to keep my mind on the work. Will went to the valley to look after the cattle in the evening and helped husk corn the rest of the time. Friday October 25th 1895 I was busy most of the forenoon with the work. We had dinner very early and Will and I went to town. I drove on our home. Ida and he Mother went home this forenoon The girls had intended to come out if I had not gone in. We did the evening work and I knit some. Saturday October 26th 1895 I was at home at work all day. Will helped husk corn after early supper the boys went down town with us. Will took me over the river. Mother and I spent the evening at Fannys. A mild day.